Synthetic & Bio-based Dimethyl Ether (DME) Market size is forecast to reach USD 14.46 billion by 2025; according to a new research report by Global Market Insights, Inc.
Dimethyl ether is eco-friendly and cost-effective in nature and is considered as an effective alternate transportation fuel for diesel. Product possess comparable properties with diesel and emits low soot which will help reduce harmful implications towards human health and environment by reducing pollutants. With rising concerns to attain environmental sustainability, several players in the dimethyl ether market have launched DME fuel compatible vehicles to promote sustainable road transport development. For instance, Volvo Truck Corporation has launched Volvo Bio-DME trucks which are compatible to run on renewable fuels and provides comparable performance along with lower CO2 emissions. Dimethyl ether also finds widespread applications as an aerosol propellant across several end-user industries including pharmaceuticals, cosmetics, paints & coatings, etc. It is extensively Used across various industries owing to low cost, low odor, high stability & purity, low toxicity, wide vapor pressure range, and environment-friendliness and flammability. In the cosmetic industry, it is used in hair spray, fragrances and various other products. The benefits of dimethyl ether as an aerosol propellant such as purity & stability, low relative cost, low odor, wide vapor pressures range, low toxicity, flammability and environmentally friendly nature of the product has been playing a vital role in capturing an extended customer base primarily in North America. Fossil fuel based DME led the synthetic & bio-based dimethyl ether market in 2018 and is forecast to exhibit high growth rate over the forecast timeframe. This is attributed to abundant availability of natural gas recoverable reserves which can be utilized to produce product for its widespread applications in LPG blending, aerosol propellants, transportation fuel and other industrial applications including refrigerants, blowing agents for insulation panels, fuel for welding & cutting, and the solvent extracting agent, etc. Easy availability of natural gas owing to technological advancements which is attributed to high R&D investment in the oil & gas industry will help attain promising gains by fossil fuel based DME market size by 2025. 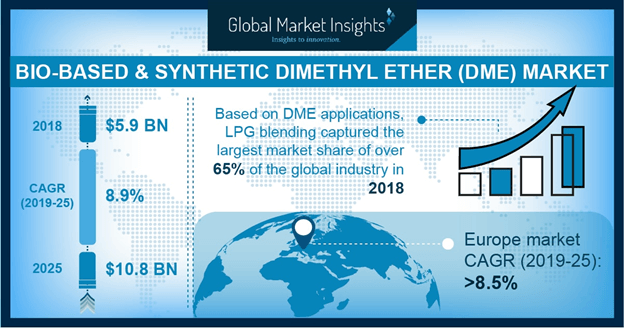 Global dimethyl ether (DME) market size for LPG blending led the overall business in 2018 and is likely to observe promising growth of 7.6% over the forecast timespan. The prime factors responsible for increasing DME demand for LPG blending is the pressing need to reduce harmful emissions which has been increasing owing to rising population primarily in Asia Pacific. LPG use for heating and cooking for domestic purpose has been a major cause of increasing harmful pollutants in the environment which can be condensed by LPG blending with DME which is added up to volume concentration of 15-20% and is feasible to add value adding benefits to LPG use across domestic purpose. Asia Pacific, chiefly led by India and China, accounted for major share in global dimethyl ether market in 2018. In addition, the region will experience significant growth rate over the forecast timespan. High product demand in Asia Pacific is attributed to its widespread applications in LPG blending which is gradually gaining momentum to attain environmental sustainability. Improving regulatory framework in the favor of environment in the region is encouraging product applications in LPG blending to reduce soot, particulate matter and other pollutants to improve the overall air quality in the longer run. Global DME market comprises many large multinational players as well as mid-scale vendors. Some prominent players operating in the industry are China Energy Ltd, Akzo Nobel NV, Royal Dutch Shell PLC, Korea Gas Corporation, Mitsubishi Corporation, Guangdong JOVO Group Co., Fuel DME Production Co., Ltd, Ltd, Grillo-Werke AG and Shenhua Ningxia Coal Industry Group Co.